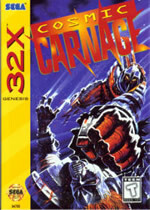 One of the few fighters created just for the 32X was an obscure game called Cosmic Carnage. Unlike the majority of those on the system, this one was actually an original game and not a port of an overused arcade title like Mortal Kombat or Primal Rage. It was released only on the 32X, so it is virtually unknown due to that add-on’s failure (it wasn’t the only game to suffer such a fate). 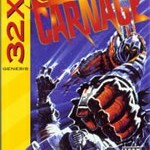 A beat-em-up with little innovation or any special qualities to make it stand out in the crowd Cosmic Carnage wasn’t anything special and if you haven’t played it, then don’t worry because you haven’t really missed out on anything. The majority of fighting games all seem to revolve around contests and/or tournaments and Cosmic Carnage is no exception. Basically, what happens is that a prison spaceship carrying a handful of alien convicts gets in trouble when the convicts break out and try to take it over. It essentially becomes a flying time bomb and there’s only one life pod left (gripping, isn’t it?). The aliens decide to hold a fighting contest with the winner being the one to get off the ship alive. I guess the best aspect of Cosmic Carnage is the fact that it is pretty original. Apart from the fact that it’s based on a contest like every other fighter out in the gaming world, it takes a slightly different approach to it. Everybody knows that story lines aren’t that important in a fighting game because the gameplay is what matters but this game is a slight exception. The plot is a lot better than the story lines of that other original 32X fighter, Brutal: Above the Claw mainly because it isn’t about some all-powerful boss guy creating a contest. Cosmic Carnage has eight original characters that you can choose from, composed of an array of bizarre aliens that have varied abilities and attributes. They range from a gargantuan snake-like creature to a dark gorilla-like monster holding a samurai sword. Each character has a set of unique moves and a different control scheme, which I found quite interesting. When you look at almost all of the fighters from that era, there are always two or more characters that are almost identical. A few that come to mind are Street Fighter’s Ryu & Ken, Mortal Kombat’s Scorpion & Sub-Zero, and Primal Rage’s Blizzard & Chaos. A feature in Cosmic Carnage that a lot of fighting games don’t have is the option to give your character armour. With a full set, you can take less damage and inflict more but it can be ripped off. The game sports some colourful and very bright graphics, which compare more favorably to a SNES game rather than a 32-bit console. Each character looks decent enough but most of them aren’t too impressive. The characters look good when the camera is zoomed out because the detail is sharp. This probably shows the best sprite animation you are going to get from this game. The backgrounds are pretty good though, the stars shine (literally) in the backgrounds and the space theme, which isn’t really used that much in fighters, is beautifully portrayed. The majority of backgrounds are realistic pictures of the Milky Way, stars, and planets but some of them are actually inside. These last areas tend to be pretty poor overall. It’s well known what people say about the 32X’s sound chip, but Cosmic Carnage does a great job of overcoming the hardware. Unlike the jumpy and low music that tends to curse most games on the system, this one has reasonably decent music is pretty fast paced. It really shows what could be done with some half-decent programming. I was actually surprised that this game had such quality music even though the tunes aren’t too good and are not much of a change from the usual trash that comes spewing out of the 32X sound processor. The worst aspect of Cosmic Carnage is the gameplay. Do not even go near this game if you only have a three-button pad. The controls are so awkward that it’s pointless to even try and enjoy this game because of their stiffness. The commonly used “A-weak hit, B-stronger” is okay for new gamers and the majority of fighter veterans will get the hang of it quickly enough but the gameplay’s overall unresponsiveness can be highly annoying at times. The zoom-in and zoom-out of sprites has been used in few 32X games but is a main draw in this one. If you pull off a move, sometimes your character (or parts of him) will go flying up and into the screen. I don’t know why this effect is used because it looks awful and it is incredibly disruptive. The graphics are very hazy when this occurs and look pathetic. It was bad enough when it was used in Knuckles Chaotix, but it is even worse here. If you are looking for a new fighter to try out, then stay away from Cosmic Carnage. Sega may have made brilliant fighters like Eternal Champions and the Virtua Fighter series but they dropped the ball with this one. If you aren’t merely a game collector and you actually happen to enjoy playing 32X titles, then I would only get it if you have played Mortal Kombat, Primal Rage or Virtua Fighter instead because they have so much more to offer.